Mobile learning presents so many exciting opportunities for learners and organizations alike. Connecting people with the information they need—no matter where they are—makes them more independent and autonomous. And organizations that embrace mobile learning will find themselves able to scale their training efforts more cost-effectively. It’s a win-win! With these perks, we expect you’ll increasingly be asked to create e-learning content that looks and works great on mobile devices. There are different ways to do this, but we think you’ll love our approach to delivering multi-device e-learning. Why? Because the technology just works. Before we introduce you to our cool new tools for creating multi-device e-learning, let’s look at how another authoring tool tackles this challenge. Using Adobe Captivate to create e-learning for mobile devices requires a lot of steps. You need to adjust the elements on all your slides for the breakpoints you’ll encounter on different screen sizes. That means you have to manually customize your content for each possible platform your learners could use to access your content. This approach puts the responsibility of making sure that your project looks the way you want, on any device, squarely on your shoulders. We know that you care about the keeping your course looking the way you intended it. And when you’re creating slide-based e-learning, that means preserving the positioning of different elements on your slides. For example, let’s say you’ve designed a slide where a character is pointing to an object to her left. When the screen narrows considerably for a mobile phone, the slide won’t work if the character and object get repositioned. Learners will wonder what your character is pointing at if the object is now above her head! With Captivate, you have to re-design each slide for the screen size of each device you plan to support. With all the different devices out there, we just don’t think it’s realistic for e-learning developers—who already have tons of work on their hands—to be required to tweak their courses for every possible screen size. That’s why we’ve taken a different approach to helping e-learning developers create training for mobile devices. With the responsive player in Storyline 360 and Studio 360, the courses you build with these apps look great on any device automatically. It takes just one click to publish your courses. Then, when your learners launch your course (no special app required! ), the responsive player will detect when they’re using a mobile device and adjust to fit the screen size. What’s great is that the responsive player does this without shifting the content on your slides. It fluidly responds to different mobile screen sizes and orientations, hiding sidebar menus, eliminating browser chrome, and delivering mobile-friendly playback controls. It’s like watching a video on your smartphone or tablet: the picture is scaled up or down depending on how much screen real estate is available, but the content is left just as the director intended. When you publish your Storyline 360 or Studio 360 course, the responsive player reacts the same way. It optimizes the screen real estate but doesn’t change the content itself. The responsive player also supports touch screen gestures for a more natural experience on tablets and smartphones. Want to see an example? Watch this video by our CTO Arlyn Asch. He'll show you the responsive player in action. 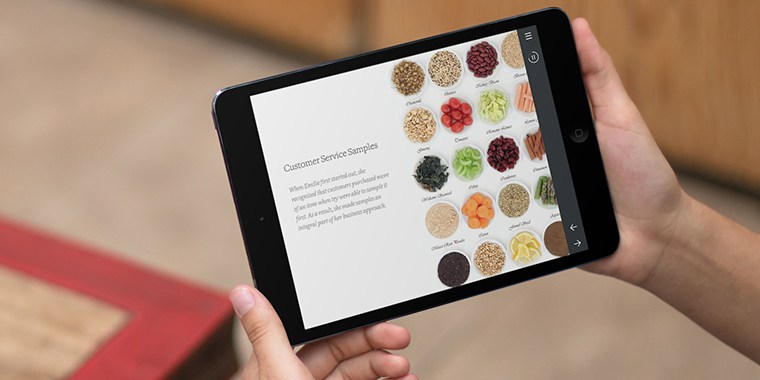 Then check out this course demo, created in Storyline 360, on your phone or tablet. See for yourself how awesome it looks! We think you’ll like our approach to creating multi-device e-learning. It lets you focus on creating beautiful courses, not adapting those courses to countless device sizes. You can even use the responsive device preview to see how your course will look in different devices and orientations before you even publish. That makes it so easy to understand how the course will feel for learners, no matter how they’re accessing it. Once you’ve designed the experience you want your learners to have, you publish once and—voila! It just works, everywhere. No tweaking required. Whether you’re previewing or publishing, Storyline 360 and Studio 360 do the work for you to make sure your course will look great on any device. And if you have a big library of content you’ve already created in Storyline 1 or Storyline 2, we have awesome news for you. You can re-publish your courses with Storyline 360 and they’ll work perfectly with our responsive player. To take a deeper dive into creating multi-device courses, check out our detailed “The Definitive Guide to Multi-Device E-Learning” e-book and the FAQs about the responsive player here. Then get a free trial of Articulate 360 to try out the responsive features in Storyline 360 and Studio 360. Note: The responsive player is also available with Storyline 3. Hi. When I checked out the "course demo" link, it did not work on my iPhone. Am I missing something? I had posted a comment on another page also and they got it fixed from there. Thanks. What would be amazing is if you could take advantage of both approaches. Scaling up and down for mobile in Articulate is great and the new mobile navigation is awesome. But, it would be nice to have the option of changing a layout for mobile if the situation calls for it. Sometimes a scaled down version of a module needs some finessing to work on mobile well. Planning for this with 'mobile first' can help but I'd love to see the option added in later versions. Great work with the mobile output though! I love the mobile player interface. Has that been incorporated into the desktop player yet, and if not, when? I think what they are saying is they made the player responsive (with content scaled) where captivate has the option to make content responsive - but it is more work. The content scaling was already available in storyline in the player settings though. So you still have one layout that must work on all screens. The new mobile player gives you more space by losing the menu. It looks great though and I agree with Chris, would love to see it as an option on the desktop output! Storyline is NOT responsive. If you create a course in landscape, and view it on a mobile phone, the content will scale like previous versions of SL. Only now, the player will be responsive (if you actually use their generic player), but the content will scale/shrink down to be unreadable. I hope the SL team can keep up with the standard expectations of mobile devices.